I used to love PCH Kristine Series but when the second book had unfolded, my appetite for it diminished. I think it’s because of 1) the disappearing act of the talented Denise Laurel playing Emerald, 2) the addition of too many characters that somehow made the plot complicated and 3) the too many bed scenes shown. I know I’m not the only one who noticed and didn’t give a nod of approval to some or all these things. With my reception towards PCH Kristine Series reaching an all-time low, another ABS-CBN teleserye has caught my attention. It’s vampire-werewolf themed and has a stellar cast. Two of my favorite local celebrities are in it, Angel Locsin and John Lloyd Cruz. The war between vampires and werewolves may be old but let’s admit it, we continue to find it compelling. This is basically what Imortal, a fantasy series, is playing into. But to make it appealing to the younger generations, they injected a love story ala Romeo and Juliet and a prophecy that could change the lives of the lead characters forever. Angel Locsin and John Lloyd Cruz have great chemistry on-screen. I love their acting, particularly how they portray their ‘you and me against the world’ thing. I also adore the talented Maricar Reyes who never fails to give a breath of fresh air in the show with her mere presence. She deserves a leading man, too! Currently, Imortal is on one of its critical moments. Conflict has ensued in the world of the lobos following the discovery of John Lloyd Cruz’s Mateo as the ‘itinakdang bampira‘ (the chosen vampire). Angel Locsin’s Lia, the ‘itinakdang lobo‘ (the chosen werewolf) is doing all her might to protect and save him not just from the claws of the misled Waya authorities but also from the powerful vampire clan that wants Mateo to lead them to victory in their war against their immortal enemy. Imortal is heavy on acting and action scenes and that’s what I like about it. For the werewolves, Imortal depends highly on its graphics and visual effects. I must say it’s good, though sometimes with action scenes that require close contact between the vampires and the werewolves, I could notice some distance-related flaws. I think the technical team behind Imortal should make its action scenes more fast-paced and brutal to establish how violent and ferocious these two creatures can be. Imortal is a promising show and still has so much to offer to the viewing public. 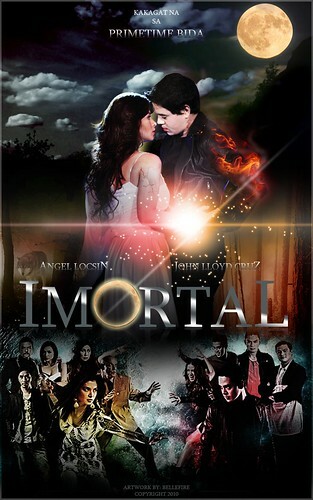 I like how Imortal is able to sustain the interest of the viewers with its fast-paced but well-documented plot. Each week, they give new development and twist to the story that make people craving for more. I hope it keeps its good work of providing quality entertainment to Pinoys at the comfort of our homes. In my case, it’s at any place that has wifi because I seldom watch it in its normal schedule and instead, I get my daily dose of Imortal thru video replays either on www.pinoy24.tv or on Youtube.com.